I use to mouse around DPReview.com checking out all the cameras I could never buy. Or so I thought. It is primarily a still digital photography site but convergence is coming. Heck, it is here. 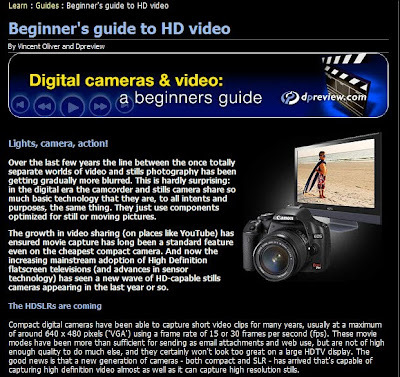 This is a guide to help photographers transition to having high definition video on their still cameras. One of the the things that I like about DPReview is that they are very detailed. You will know the sensor size of the camera in question. This answers a lot of my questions and helps me become better informed about video on still cameras. Very helpful article.